All agricultural commodities covered in this report are of critical importance to global food and feed markets. They constitute much of the world’s food consumption, generate income to farmers and represent the largest portion of food import expenditures across the world. The analysis in the report puts in perspective market developments in recent months with a view to provide some insights into how the outlook might unfold for the commodities covered during the coming months. In recent weeks, international prices of many agricultural commodities have started to fall and early indications do not preclude further declines in the coming months, however, prices are unlikely to return to the low levels of previous years due to a host of reasons, including the escalated cost of inputs. 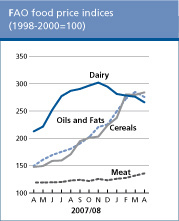 Moreover, a number of demand factors such as the need to replenish stocks and expected increases in utilization are keeping prices high despite a favourable global production outlook.The most influential development in pushing up international prices of basic foods has been the low level of exportable supplies, resulting from utilization outstripping production for several crops in a number of major exporting countries. Rising utilization levels would necessitate more than one good season to bring about a meaningful replenishment of stocks and hence a reduction in price volatility. Soaring food prices have led to serious difficulties, especially for vulnerable population groups that spend a substantial part of their incomes on food. Perhaps one estimate sums up best the overall impact of the higher prices: the USD 1 035 billion that the world is forecast to spend on importing food in 2008. This means an additional USD 215 billion on top of the record bill registered in 2007. Food is no longer the cheap commodity that it once was. As the global food import bill has entered the trillion dollar territory, the food import bill of the Low-Income Food-Deficit Countries (LIFDCs) is likely to climb to USD 169 billion in 2008, 40 percent more than in 2007. Rice has caught the headlines in recent weeks, but from dairy to wheat and soybeans to sugar, price spikes and market volatility appear to have become more the norm than the exception. The FAO Food Price Index in April showed no increase compared with the previous month, but March was the month when international prices of many commodities reached their heights. Against this backdrop of changing and increasingly unpredictable markets, there are also some positive signs. Recent events have brought agriculture back to the centre stage. World leaders are coming to Rome to attend the High-Level Conference on World Food Security: the Challenges of Climate Change and Bioenergy to be held in June 2008. Governments are showing concern; giving strong support to calls for short-term humanitarian assistance as well as for longer term aid to the agricultural sector, enabling it to adjust to the ever increasing world demand in the face of growing resource constraints. Collective international action is needed now to develop agriculture and fight hunger. POTATO: AN ANTIDOTE TO HIGH FOOD PRICE INFLATION?